Alice Wharton, is the programme manager for the Community Shares Unit based in Manchester. In this blog post she reflects upon the launch of the first Community Shares Booster Programme, a cooperation with Power to Change. This week, we at the Community Shares Unit (CSU) are really excited to be sending out our first offer letters for the Community Shares Booster Programme. The Community Shares Booster Programme is a new innovative initiative to support and foster community business across England. If successful a community business can receive a business development support grant up to £10,000 in advance of launching a community share offer. After that, they could have access to match funding in the form of an equity investment up to £100,000 when the share offer goes live. When Power to Change first approached the CSU in 2015 with the idea, we thought the time was right. It was a great opportunity to stimulate new approaches to using community shares as a funding mechanism for community projects wanting to develop into sustainable businesses. The CSU is also interested in using the Booster Programme to develop understanding about the role of institutional investors and their relationships with community investors. Buying community shares in a community business allows the public to become more involved and engaged in the prosperity of the place they live in. They can be loyal customers, and many are willing to be volunteers and activists, using their skills, expertise, knowledge and passion for the benefit of the enterprise and the wider community. Community businesses are a means of taking action to address local challenges and control vital assets and services that might otherwise disappear. We’re pleased to announce the first round of beneficiaries to be supported through this Programme; Friends of Stretford Public Hall , Leeds Community Homes, Sheffield Renewables and Sutton Community Farm (pictured above). Already we have a good range of sectors taking part in the Programme, such as regeneration, housing, energy, and farming. In this first round, we are also supporting a variety of places; London, Leeds, Sheffield and Manchester. have secured the ownership of the impressive Stretford Public Hall and now plan to use community shares to raise the capital to establish it as a multi-purpose facility, to deliver a range of social and economic outcomes in the area. seeks to take a community-led approach to creating a more affordable, sustainable housing. It will purchase land and buildings to create homes for purchase or rent. It will also provide support to people in Leeds to develop their own community-led housing solutions, including the renovation of empty homes. 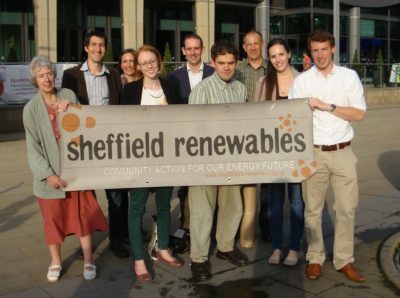 is a mature community business that already has a share offer from 2012 and is now working on furthering its goal of making Sheffield a cleaner, greener city by launching a new PV panel project working together with a variety of local organisations. is community-owned on the edge of South London. It aims to improve access to fresh, healthy food, provide education and volunteering opportunities, and to promote active lifestyles via their veg box scheme and wholesale sales to restaurants. Unfortunately we had to turn down some good applications in the first round but now we are assessing the second round, which is again looking strong with some really diverse groups applying. The CSU is looking forward to working with these groups to explore innovative uses of community shares, supporting them in using the grant to develop their share offer documents and having them assessed for the Community Shares Standard Mark. We are excited to see the share offer and to take up the opportunity for equity investments of up to £100k via the Booster Programme. The results of the Booster Programme will allow us all to learn more about different ways to effectively use community shares to help communities improve. We are excited to see the Booster Programme supported groups progress towards their share offer launch and develop into sustainable long-term businesses. Find out more and apply to the Community Shares Booster Programme.